At Google, we know that you want to be more productive when building apps. We’ve been listening to your feedback and — based on your comments and ideas — have begun prototyping new ways to make Developers Console more useful, usable, beautiful and well crafted. 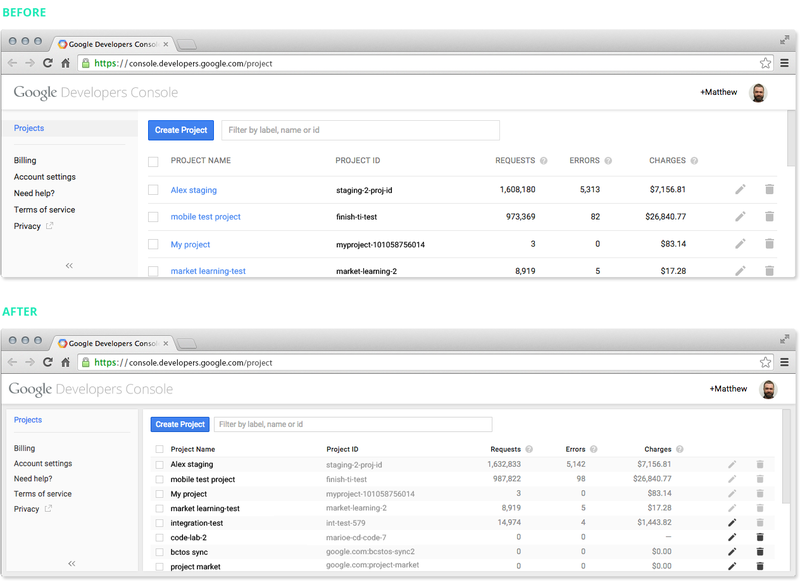 Our first improvement is to reduce wasted space in the Developers Console user interface (UI). You told us you could be more productive if the UI took up less space. We responded by optimizing the layout for scanability. We increased the amount of information you can view without scrolling – displaying nearly twice the number of rows visible on a typical laptop – by adjusting table layouts. Columns are now neatly compacted for better readability, especially when many columns appear. This makes it easier to multitask when another browser window or application is open. We’ve also made adjustments to spacing and sizing of fonts, buttons, icons and all other UI elements to allow for easier browsing of logs, instance lists, code and… well, everything. Another benefit to the new design is that it will allow you to see more — and do more — without losing context or waiting for pages to load. Soon, when viewing a list of resources, you’ll be able to see or edit details of a list item without leaving the list. Ultimately, we want to make your job easier. We’re working the long hours now so you don’t have to; so you can spend more time doing the things you really love to do — making amazing things and putting them into the world. And we’d love your help. If you have ideas on how we can make Developers Console more useful, usable, beautiful and well crafted, please fill out this form. Next: I don’t like our companies process. How do I tell my boss?